Summer Solstice Is The Time To See All Things Fairy. The Fairy Harpist miniature doll with hand customised fairy harp. Each year around the 21st June is the Summer Solstice, the longest day of the year when the sun is nearest to the earth, here in the Northern Hemisphere. It is supposed to be the true start of Summer…..although with all the rain and lower temperatures than April here in the United Kingdom, I am begining to think that Summer has been and gone earlier this year! The Summer Solstice is also supposed to be a very magical time according to ancient legend and folklore. On this day at dawn or at dusk, if you are very lucky……you may just be lucky enough to see……….wait for it……….fairies! It is said that at these special times the veil between the world of humans and the world of The Fae is very thin and you may just be able to glimse them dancing and celebrating, for fairies love to party. And if you see any fairies that need some shoes, please tell them that they can buy some from me in any colour they would like! Miniature Fairy Slippers, just an inch long. Made in silk, with cotton lining and little leather soles. Shown with an English penny and a US five cent piece. But just in case you don’t get to see any of them this year, I thought I would share some pictures of some of my own fairies with you instead. But before I do, you may remember a certain little Baby Fairy who donated herself as a prize in my competition in May. Baby Fairy is now enjoying a life of leisure in Wales and if you would like to hear all about her new home and new friends, let me know and I’ll see what I can do……….I’m sure she would be thoroughly delighted to tell you all about it! 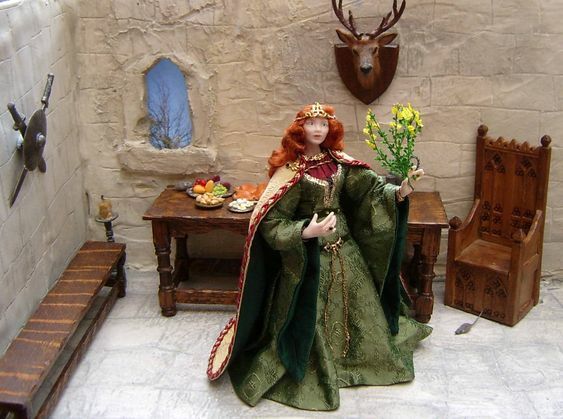 I have loved all things FAIRY for as long as I can remember and I really love making them as miniature dolls. Below are some of my favourites made over the last few years. Mother and baby fairy sleep soundly on separate flowers in 'Rose Dreams'. One of my favourite and most recent fairies was ‘The Fairy Flower Seller’, detailed in a previous post. This one took a very long time to make with all the tiny flowers to secure in place but was a very enjoyable project. I chose lavender over pale pink silk for this fairy and dyed the flowers to go with these colours. The Fairy Flower Seller with her pet unicorn who carries all the flowers for her. 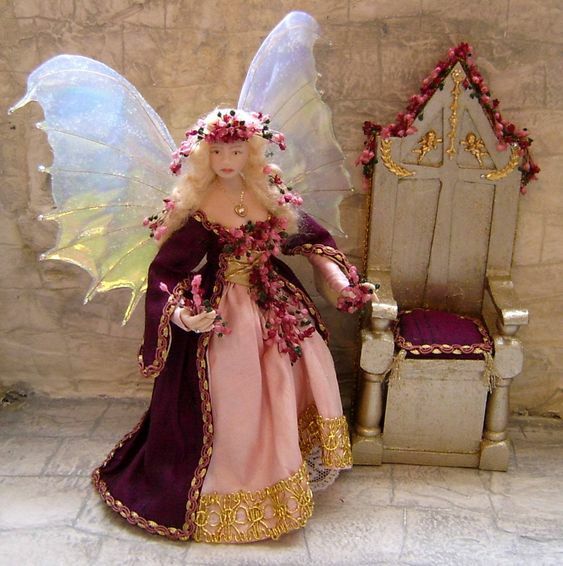 One of my most popular fairy ensembles has to be ‘Holding Court’, a miniature Fairy Queen with floral crown, sitting on a golden flower-decked throne. For this fairy I chose a shot (two tone) silk sold as ‘Blackberry’, quite a bold and dark purply pink with black cross weave. To contrast, the under-gown was made in pale pink silk with metalic gold fancy braid and gold criss-cross on the bodice. Again, all the flowers were hand-dyed to match and tone. 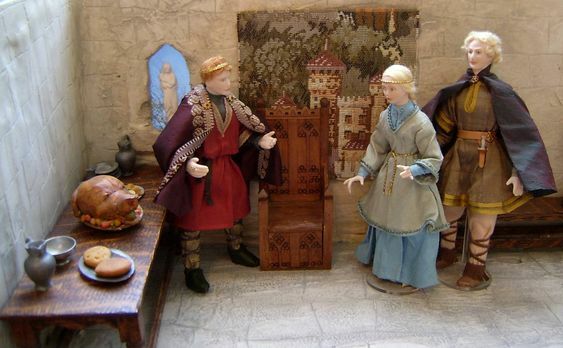 'Holding Court' miniature fairy ensemble. The 'Holding Court' customised throne. You may have noticed the ‘Fairy Harpist’ at the top of this page. She came about mainly because of some favourite music on a cd that I love to listen to when I am designing and creating my fairy folk. This is a cd of the beautiful (in my opinion) Victorian harp music, recorded by an equally beautiful harpist, Elizabeth Jane Baldry. The cd is called ‘Harp of Wild and Dreamlike Strain’ and is a collection of fairy-themed Victorian music never before recorded until Elizabeth Jane recorded it in the 1990’s. I believe it is still available and can be obtained from Elizabeth Jane’s web site (see link in blogroll or at the end of this post). Side view of the miniature Fairy Harpist. Back view of the Fairy Harpist's gown. I already had a miniature harp in my dollshouse so this was quickly ‘borrowed’ and customised with gold glittery paint, golden ribbon, filigrees, crystals and tiny dried flowers to match the Fairy Harpist. It took a long time to carefully secure all those flowers into the right places but was worth the time and effort. Front view of the miniature Fairy Harp. The harp stood about six and a half inches tall.Back view of the miniature Fairy Harp. Well that is all for now, but if you have enjoyed this post please leave me a little message as I would love to hear from you. If you would like to see Elizabeth Jane’s web site please click here. If you like miniatures please do take a look at the latest AIM (Artisans in Miniature) online free magazine here. Yes, I know I said it last time but I can’t believe we are already into another month…..just where IS the year going?! All sorts of things are popping up in my garden, including yet more daffodils, more pear blossom and damson blossom too, plus pretty little forgetmenots and cowslips. The birds are singing, the bees are buzzing and Spring is definately springing now. I recall a very old saying about Spring……. 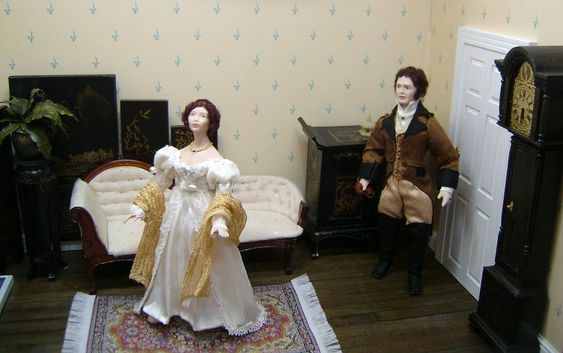 it is ‘when a young man’s fancy turns to thoughts of love’ and with a Royal wedding planned for the end of April, what a good time to share my wedding gown-inspired miniature dolls and doll costumes. 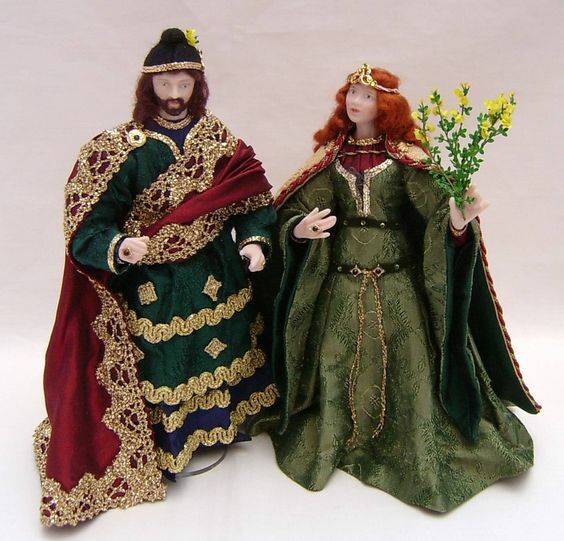 On the subject of Royal Weddings, I had some lovely commissions to do for a very nice lady called Tracie who wanted me to create some royal weddding gowns in miniature for her. 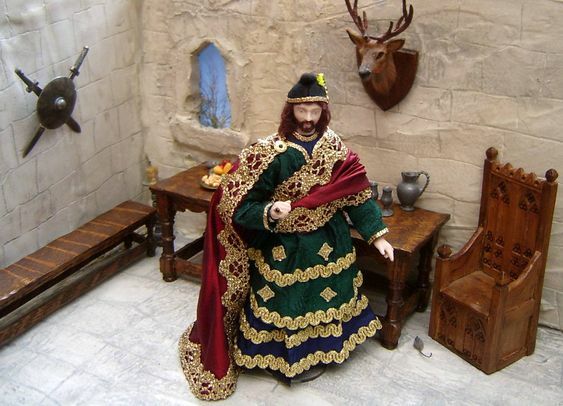 I was asked to supply them on miniature dolls but without the faces painted so that they would look like shop mannequins. Front view of the Princess Diana wedding gown. The back view of the Princess Diana wedding gown train and veil. Side view of the Princess Diana wedding gown, showing train and veil extended. Another very famous and royal wedding gown that Tracie commissioned from me was that of Princess Grace of Monarco. I absolutely adored making this one! It took a bit of doing as there is even more work in this than in the Princess Diana gown but I had such a lovely time creating it. Front view of the miniature Princess Grace wedding gown. Front view of the Princess Grace wedding gown with the train and veil in view. Princess Grace wedding gown from the back, showing the lace fishtail panel in the train. Princess Grace head and shoulders shot showing the bodice detail and the front of the headdress. Picture taken from above showing the intricate detail on the back of the Princess Grace wedding headdress. 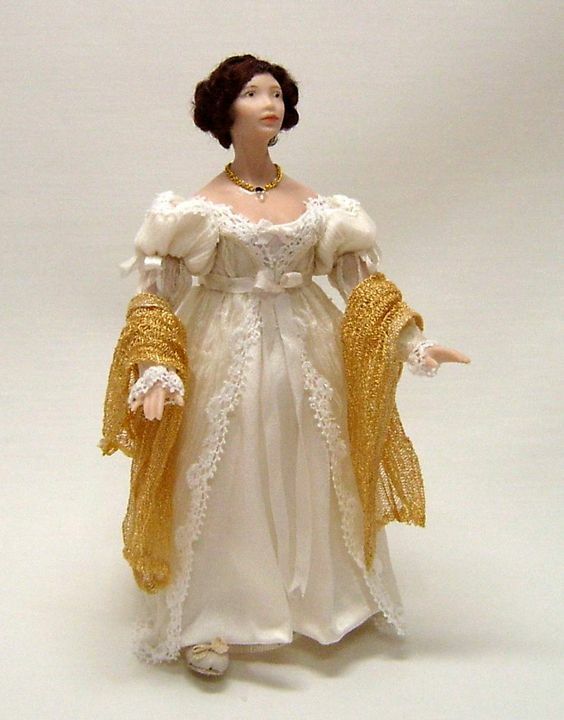 Miniature Queen Victoria in wedding gown. Front view of the sixteen inch Queen Victoria wedding gown. Back view of the sixteen inch version. showing train. Of course, not all famous wedding gowns are made for royalty. Some wonderful examples exist that were once worn by celebrities on their special days. Miniature version of Patricia's wedding gown and veil on display dummy. Miniature Joan Kennedy wedding gown with veil on display dummy. Miniature version of Joan Kennedy's wedding veil. My miniature version of the Jackie Kennedy wedding veil shown draped here. Miniature Jackie Kennedy wedding veil in silk tulle and lace. Since this has been quite an epic blog posting, I have decided to come back with part two in a couple of weeks, since I don’t want to bore you all to sleep!